Our last World Tour of Design took us to England, where we explored English Country and Victorian style for your home. Today I’d like to continue the world tour with what I’ve learned about Russian architecture, art, and interior design. Most of the iconic architecture in Russia is church-based. For centuries, only churches could be constructed of stone, and those are the buildings that have survived the test of time. They also reflect the diversity of design during several eras in Russian History. Saint Basil’s Cathedral (circa 1560), for example, is representative of the Renaissance Era. The dramatically sloped roofs on the numerous domes of each structure make a powerful visual impact. Today, Russian interior design is a cultural mix that reflects country’s commitment to art, education, and music. Heavy, rich fabrics are used for window treatments and thick, comfortable rugs adorn the floors. Remember, Russian winters can be brutal, so interior design tends toward warmth and comfort. Interior décor in Russia has, for the most part, been conservative, with weighty furnishings of heavy wood. As their economy makes a comeback, modern home furnishings now have a more minimalist style, with a heavy emphasis on artistic accessory pieces. 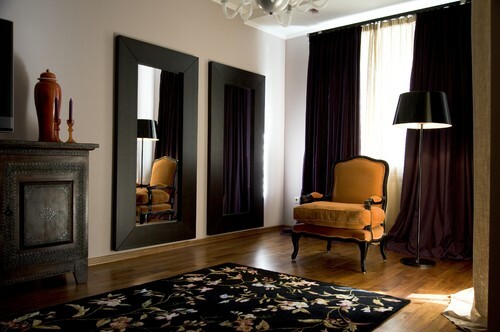 For more interior design inspiration, contact me at Interior Makeovers, Inc. by calling 310-788-0990. I’d love to hear about your design visions for your home or business. Visit me on Facebook, too!